The oven solder leadfree paste very well. The oven can be connect with PC, easy to input/set/transmit/adjust/save/manage wave data. Many kinds wave input style in control software, easy to set wave. The control software is with graphical display, display the wave intuitively. The control software is with wave printing function, easy to save/manage/analysis the wave data. The control software is with 299 kinds of paste data inside. Adopt stable and high-speed MCU and advanced intelligent temperature measurement technology, temperature in the oven is very stable,exact and even. Add the compensation circuit, make the oven temperature keep stable from different environment. This oven is with hot air fan inside, to make the temperature inside more even. 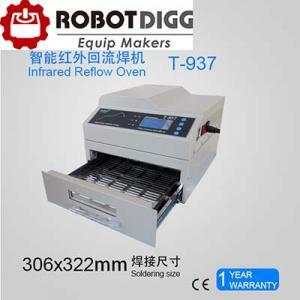 The temperature is room temp to 350C, suit for single/double side PCB board and lead/leadfree paste soldering. Add special exhaust on the back, provide good operation environment. Friendly human-machine operation interface, perfect LCD display, very easy to operate. Remark: The computer in this picture is only for ref. It is not included in packing list.